Embark on a platform fuelled adventure through Phosphur's brain sneeze and make your way back to Sack reality. Best experienced 1 player. Please let me know if you find any problems. This little gem will have you bouncing back and forth, up and down, and everywhere else in between. The clean aesthetics and music may make you think this will just be a walk in the park, but it's not. This level will have you smiling with glee and forcing a death grip on your controller as you bounce through this lovely platformer. I found that the difficulty was pretty spot on. Some of the obstacles can be really tough until you find just the right timing to get through. Woo Hoo! I had a blast playing through this level. A very polished design that will have you weaving in and out of the layers and bounding to and fro. Bossveg has created a level with fantastic visuals and even better gameplay that seems fresh and new every time I play it. Several of the mechanics had me oohing and aahing as I went behind one layer and bounced through another. One key thing that I really liked about this level, was that there was only one obstacle to avoid. It's the same obstacle through out, but is used in many different ways and never gets redundant. You'll see what I'm talking about when you close your eyes and a have a Phosphur's Dream. Brain sneeze, huh? Doesn’t sound like anything you’d want to get too close to but in this case you’d be wrong. Phosphur’s “third eye” launches you into a world filled with the glowing colours of a stained-glass window, wonderful music and, above all, some great platforming. Bossveg has managed to strike the perfect balance between fun and challenge with this level. It’s packed with some truly inventive obstacles (timed trigger bouncepads!?!) which require both thought and timing to get past. The pace remains fluid throughout, as Bossveg has you twisting in and out of the layers and bounces you around behind the scenes with his cunningly concealed contraptions, collecting bubbles as you go. This is platforming at its best - fun, exhilarating and satisfying to get right! Oh and popping those huge rainbow-iridescent 1,000 point score bubbles was just the icing on the cake for me. This is one dream you won’t want to wake up from! Fast Platformer* Fight your way through in either Normal mode, or Race mode! A solid and unique wooden design, combined with fast paced platforming, makes this level worth playing! (or at least in my opinion xD) Special Thanks to Festerd_Jester for the Music! Ha Ha! Another great platforming level to feast your eyes on. I love intricately detailed levels, but I also love a nice clean, sleek design and Wackania fits the bill perfectly. With its fast paced areas and fun, clever and sometimes challenging contraptions, you'll be grinning from ear to ear your whole way through. There are two play modes to choose from, Regular and Race mode. Whichever you choose, you're guaranteed a good time. Have fun! I'm in complete agreement with Bio on this one. Intricate levels with tons of eye candy are all well and good, but a level like this is not where you'll find those kinds of delights. Here, you will find a sleek, fast-paced platformer, where the focus is fully on fun and gameplay. The visuals are smart, clean and stick rigidly to the theme - this means you don't get 'lost in the detail'. Instead, you can focus on your next target, your next move, every plan you make is only aided by the design of this little beauty. Everything moves like clockwork, from the rotating sponges (ah, the joy of a rotating sponge) to the spikes popping up from every angle. Hop in and have a blast! I second oops, third that! Make no mistake, this level is beautifully designed but in an understated way that lets the gameplay shine. The mechanics are spot on - every polished wooden block drops into place perfectly and bounce pads send you soaring in a beautifully pitched arc over the lurking spikes to safety on the other side, picking up every score bubble as you go. It’s like a well oiled machine or one of those intricate wooden puzzles where all the parts slide in and out of place like clockwork. The platforming is fun, challenging too in places, and, especially in Race Mode, it’ll have you on the edge of your seat as you try to make those long jumps and avoid the ever present spikes. This platformer is a breath of fresh air - AcAnimate is clearly a creator to watch! Intro film for Sackrificed. Sackboy needs a vacation after playing over 4 million levels. What he gets is more than he discussed with his friendly travel agent. Hope you enoy! Morgana stormed into LBP2 swinging and hit a grand slam with this one. What a perfect time of year to play this level. It may be cold outside, but playing this level will certainly warm you up. Morgana has done such an impeccable job of simulating a volcanic environment that you'll be sweating bullets as you jump, bounce and swing your way through this lava strewn underworld. I really liked the design of this level and how it flowed from one area to the next. The game play is fun and has a nice mixture of platforming mechanics and challenges. If you haven't played this level, I urge you to do so. Now, if you'll excuse me, I need a glass of ice water. "Like Oh My God, you're going to have so much FUN!" Stupid Travel Agent. Fom the outset of Morgana's beautiful level, we are treated to some of the most polished cinematics I have ever seen in a level. And the fun doesn't end there! Entering the level proper sees you plunged into the deepest bowels of the Craft Earth, and struggling desperately to find an escape route. Dodging between piles of glowing lava and grappling your way up through the molten caverns, you must find a way to get out, before your stitches are singed beyond repair! Journey to the depths of the ocean and discover what awaits you on your journey through an underwater cave in this top down shooter. People have been dumping industrial waste in this area of the ocean for years and it is starting to affect some of the fish that live here. Big thanks to Gl0ck10 for helping with the concept, ideas, story and for decorating this beauty to bring it to life even more. This level is short because I ran out of thermo. Area 02 will be much larger. Fans of the Pixeljunk Shooter games will be right at home. Don't get too comfortable though. The baddies aren't joking around. It's going to take some practice to make a perfect run on beautifully engaging level. As the description says, the level is short, but you will spend the whole time immersed in the smooth visuals, and engrossing game play. When it was all over I had almost forgotten I was playing LBP until the rate level screen popped up, and I was once again a sackperson. Geez! How did I ever miss this one!? This was incredible! The design of the level is deceptively simple, but once you start getting attacked, you realize just how complex it really is. These creatures were attacking me from every which way and I was going "pew pew pew" as fast as could, but they just kept a coming. They're fast too! Wow! It's not all frantic though, there are moments where you have time to explore this environment but guys, I'm telling you, this is a fun, and at times, a fast paced shooter that if you missed it the first go around like I did, then you have got to go put it in your queue now. One or two players recommended. it's a long level. Don't bother about the race if it's your first play. Hope you like it! I was very impressed by this level when it was introduced and I still am! Poms has laid before your eyes (and thumbs) a brilliant puzzle level. The level is dispersed with a wide variety of puzzles that are fun and challenging. Not only do the puzzles deal with magnetics and electricity, but fire and water as well. There’s even a pinball puzzle! Each area carries the visual style of the puzzles involved, such as, the fire puzzles take place in what looks like a heavy metal dungeon. Poms, you’ve wowed me again with a level that I keep coming back to again and again. I’m still reaching for that high score. Someday…someday. You’ve heard of speed dating, well poms has invented speed puzzling and though it may not make him any money, it’s certainly a fun new genre with bags of possibilities! You pilot your tiny ufo through a series of puzzles based on magnetism, fire and water, with the difficulty ever increasing and the clock ticking against you. The puzzles are not mind-bending - the true trick here is to solve them as quickly as possible and beat the clock. But don’t let your dash through the level blind you to the ingenuity and variety of the puzzles on display. It’s all very clever stuff and brilliantly packaged for maximum fun. If you haven’t played this recently then you should definitely give it another whirl – it’ll come up as fresh as paint. Crazy golf at its craziest! With this level series TOBSn08 proved again that he is simply one of the most wickedly inventive creators out there. The series has all his trade mark originality – both in the visuals and the gameplay. Golf balls have never been put to such good use! My favourite level is Inside the Castle where you are plunged into darkness only relieved by occasional dashes of neon and by your trusty glow-in-the-dark golf ball. The lighting and atmosphere are wonderful and make a brilliant setting for some crazy and challenging gameplay. Now if only golf were half this fun in real life! This is nothing like I thought it would be. I saw the title and was picturing a top-down mini golf game, boy was I pleasantly surprised! TOBSn08 has crafted a very stylistic series of levels that while the theme is golf, you don’t have to worry about coming under par here or getting caught in sand traps. The gameplay is very inventive as you’ll be chasing golf balls that trigger doors, pounce pads and platforms. There are even glow in the dark balls to be used to light your way through the dark depths of the castle. A great series of levels that is a blast to play through. No putter required. [LBP2] Tower defense fans will only have themselves to blame if they miss out on this challenging game! Battle for Austengarde (Tower defense) by Cruntles. 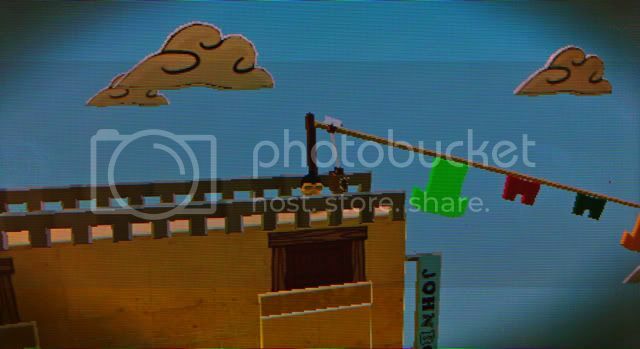 [LBP2]An excellent entry for LBPC's no floor contest. Bounce and swing through cleverly designed obstacles and contraptions in Second Hand City by Dav1d0. [LBP2]Bam! Oomph! Kapow! This is like your favorite comic book brought to life! Watch as our super hero, Rubber Band Ball Man saves the day in...The ComicBook Adventures of Rubber Band Ball Man! by Microhamster. [LBP2] If you are still in a raging fit of jealousy over your lackof Move controller, Sixax it! by DeKa1357 may be interesting to you. It takes the gameplay of "Fast Food" and makes it it's own, with one pelasant twist - You don't need a move controller! And last but not least, levels of note from our ever-shrinking backlog! [LBP2] Clever contraptions, intricate wood inlay design, fun platforming, and bubbles galore. What more could you want from a Wooden Platformer Challenge by jnstin. [LBP2] A great remake of a great game. Good design and fun challenging platforming await you in the explosion filled Splosion Bot by Spencebot. [LBP2] Holy Cow! Mega Man has invaded Little Big Planet! Take a romp through a near perfect, pixel for pixel remake of Mega Man. The animations are spot on and the 8-bit music will take you back to the glory days of the NES console. Mega Man 10 Beta by DarkSteel. [LBP2] If aliens ever peacefully invaded Earth, I can imagine it going like the way this film depicts. Well designed set pieces, superb special effects and great acting await you when you load up The Illegal Aliens! (Sci-Fi Film) by Kaiju_Kid. 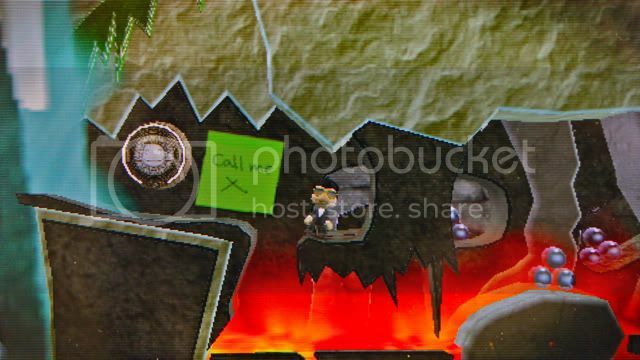 [LBP2] You’ll need both stealth and your wits to overcome the obstacles in this level. It makes great use of an inventory system that houses your trusty box (for sneakiness), explosives and your ever handy paintinator. Don’t miss out on Metal Gear Solid 4 - Act 1 by Hovoth. A Journey Retaken by Syroc. Platform level about time of The Autumn and The Winter! Who knew a level focused mostly on visuals and bubbles alone could be so good? Doggy97 seamlessly weaves these two factors together to bring us the last installment of 'The Beauty of Nature' short-series in 'Autumn Leaves.' With a pleasant color scheme and well placed bubble combos, you'll love every minute of it. Sacky stole a diamond from some gang boss and Sacky was caught. Your only hope is to escape. You have only one chance to escape. 'There is no escape' is a very interesting level. You'll find yourself jumping through a gorgeous city avoiding dangerous gangs tracking you down. But what really makes this level stand aside from others, is the utilization of quicktime events. These are almost unheard of on the PSP side, and they add much more unique tang to the level. Himoks is becoming an elite creator on the PSP, and this is one not to miss. I truly loved this level. From its basic yet lovely scenery to its surprisingly thrilling and easy-to-get-into gameplay, this survival challenge level really intrigued me. Hopefully you will enjoy it as much as I do, so go give it a play now! You're insane guys! Both crew and creators! Great Spotlight everyone! I've actually played the current ps3 spotlights and they are awesome! Nice spotlight. Good to see some psp levels this time. Will creator spotlights ever come back? Thanks guys & gals for the spotlight on my level. So happy you enjoyed it. Mega thanks for all the hard work you guys are doing and for sticking with that backlog of levels. I'm amazed and proud of all the hard work you guys do behind the scenes to bring great levels to the attention of LBPC members and visitors. Keep up the good work! I think that this needs to be put on the front page. Why won't people stop asking this question? - I asked myself " Well what levels could I play? I dont know,lets check LBPCentral and see whats the new " Then I come here and I see the 74th edition of the community spotlight. Im surprising because its quite short.Anyway Im pretty sure these levels are amazing,so I just have to add it on my queue and play them. Congratulations to all these creators who are picked and thanks to the spotlight crew for recommend amazing levels and give me the fun I looking for. - Greetings and I hope everybody have a nice day. Yikes, either the college students are busy studying for finals, anyone is working on LBL-C4C or LBPC6 levels, or anyone is busy trying to figure out what they want for the holidays. Anyways, awesome spotlight episode, crew. Looking forward to see what's next. Yikes, either the college students are busy studying for finals, anyone is working on LBL-C4C or LBPC6 levels, or anyone is busy trying to figure out what they want for the holidays. My Hat's off to all the creators of these fabulous spotlighted levels. Week after week you amaze me with your vision and talent and I thank you. I have a lot of fun playing your levels and can't wait to see what you show me in the next couple of weeks. Thank you so much for the spotlight I really really appreciate it!! It comes in a small package, but it's perfectly formed. Another episode, another collection of fantastic levels to play. not a day goes by that I am not amazed by the capabilities of this community. Congratulations to everyone chosen this episode! Whoa, small spotlight. I was just thinking to myself, where have all my favorite creators gone and will they ever be back? MIA: Lockstich and Comphermc are working on LBP Vita, Jack of Course, Morgana, Rikiriki-Ita, Ghevura, Comishguy, LFiers, Poms, Ruof. All you guys need to comeback! In the mean time the Spotlight Crew continues to shine a light on wonderful levels and this one is no exception. So thanks, Spotlight Crew. There are some great levels to look forward to though. Felkroth, Bobtox, ALS-theGamer, PIMPI, and Lord Magic Pants, all have levels in the works. Anybody know of other cool projects to look forward to or where some of those people listed above have gone? Hey thaks guys! It always feels good to be in another spotlight edition... I thought you forgot about me this time but I gess there's still plenty of stuff in the backlog. Thanks for keeping the LBPC spotlight alive with your hard work. This is certanly the best reference to get to play awesome levels in the whole internet.